MEETING THE COMMUNITIES NEEDS SINCE 2008. League City Islamic Center (LCIC) was established in 2008. We are a neighborhood masjid serving League City and the surrounding communities. LCIC is established 10yrs ago by purchasing a old house. We have 5 daily prayers, jummah salat and provide free Quran classes to children. During Ramadan the masjid provides daily iftar to the community and nightly taraweeh prayers. Our community is growing quickly and we often do not have enough space to accommodate everyone, especially during Ramadan. 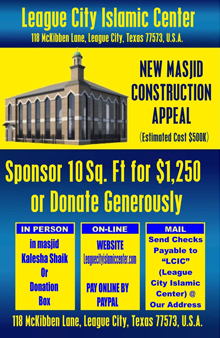 Please donate generously for the construction of a new and larger masjid so that we can meet the needs of our community insh'Allah.